I was asked to take a look at the AuthorSure WordPress plugin as a possible solution for Multiple Author blogs. I’ve previously posted about Google Authorship, which is a special tag (rel=author) that you add to your blog so that Google will use information from your Google+ profile, most notably your picture, in the snippets that show up in the SERPs (search engine result pages). AuthorSure is a relatively new WordPress plugin, however it is in the WordPress repository (always reassuring) and best of all it’s free! The supporting site has a couple of good articles and if you become a member (also free) you get access to a video tutorial. Aside from running into a conflict with WPMinify. I found the setup straightforward and quick. The author also has a Google+ business page for the plugin where he will answer questions. Getting the authorship set up for a blog that has Multiple Authors is more complex than for a Single Author blog and this is where AuthorSure shines. However it will also help you set up authorship for a Single Author blog. Although you don’t really need a plugin for what it does in this case – which is to update your “about” page with the necessary link to your Google+ profile – it makes this plugin a complete offering. Plus it helps with other social media linkage. Here are the 4 ways you can use AuthorSure to set up Google Authorship on your blog. How easy or straightforward will depend on your theme. What you choose will depend on your theme, whether you have a Single Author or Multi-Author blog and of course – your preferences. For example, if you have a Multiple Author blog and your theme already adds the rel=author tag to the Author’s name link that appears with the post, then consider using the By Line option. Otherwise the Author box option is ideal for Multi-Author blogs, the Plugin will add an Author Box at the end of each post (which you can override and disable). The Author name within the box will link to the Author Archive Page which the Plugin marks up to add the link to your Google+ page. Ideal for Single Author blogs, the Menu link option will configure your About Page with the Google+ icon and link. It does rely on having the XFN tag set to “author” for your About page in WordPress menus. A decision tree to help you decide which option would work for you is provided at the AuthorSure site. Since I was most interested in the Author Box option, here are the steps I took to install it on my blog. Keep in mind that as a Single Author blog – the Menu option is what I normally would want, but my motivation was to review the Multi Author approach of the plugin. Install the Plugin: Go to Plugins -> Add New. On the Install Plugins Page, search for AuthorSure, and install the Plugin. Configure, Go to Settings -> AuthorSave. First you select which of the 4 options you want to use. Add Author information to your Archive pages. Add a rel=publisher tag to your home page and Archive pages – this didn’t seem to work for me. Configure your Author pages – depending on the option this will be the Archive page or your About page. 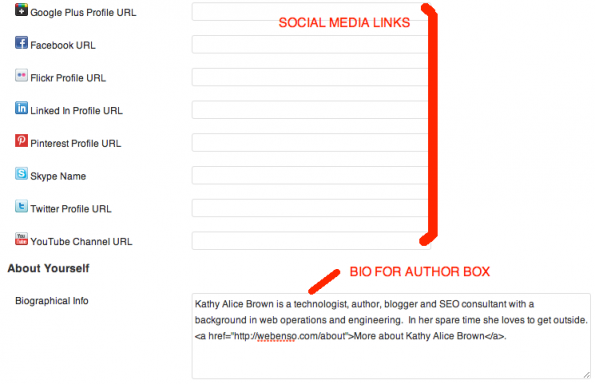 Create your bio: If you are using the Author Box option you will need each Author to enter their bio into their profile settings in WordPress. Edit Profile can be found by clicking on the “Howdy ..” message on the dashboard bar on the upper right. After you have configured the AutoSure Settings, have each Author enter bio and social media info. Each Author will also need to have a Gravatar set up as this is what AuthorSure uses for the Author picture in the Author box. A nice feature I particularly appreciated was the ability to disable the Author Box for all my pages (which in my case is just the one About page, but still). AuthorSure also adds the ability to disable the Author Box on a post by post basis with an AuthorSure settings checkbox available while you are editing your post. When I first activated the AuthorSure plugin, my CSS formatting completely broke. Visiting the Google+ page I saw a comment that WPminify had caused a problem with author boxes for another site. Deactivating the WPMinify plugin fixed the problem. There is information in the FAQ pages to help with CSS styling the Author box. I kept it as is as the default styling works fine for this blog. AuthorSure, out of the box, creates an Author Box that links your display name of your profile to your Author page. This is great for Multi-Author blogs which can configure the Author Archive pages with the Google+ links. However I didn’t want my Author Archive page public on my blog for various reasons and I already have my Google Authorship set up, so I removed the link so I could keep the Author Box and the plugin activated. You can see the Author Box at the end of this post. (Note: In 2014 I switched to using the Starbox plugin for my author box as it is lighter weight). AuthorSure certainly has a lot of bells and whistles, I felt like I just scratched the surface in figuring out what this plugin could do, so it is definitely a flexible and powerful solution for Google Authorship, especially if you have a Multiple Author blog. However since it touches so many WordPress components, some tweaking might be required to get everything working. I’m interested in a comparison/critique between AuthorSure and Google+Authorship plugins. The other plugin that I am aware of is the WP Google+ Authorship plugin. This one has you set up your Google+ profile and then gives you a shortcode that you can use to create the link back to your Google+ profile. The description on the plugin is a little lacking so I’m not entirely sure how it’s implemented, but I believe it would work for the 2 way linking scenario. I would have to see how well using shortcuts outside of the post content would work (eg. on the author page), I haven’t done much with shortcodes in that way. Maybe add it to the sidebar? So in summary, I think AuthorSure does more for you and provides more options.